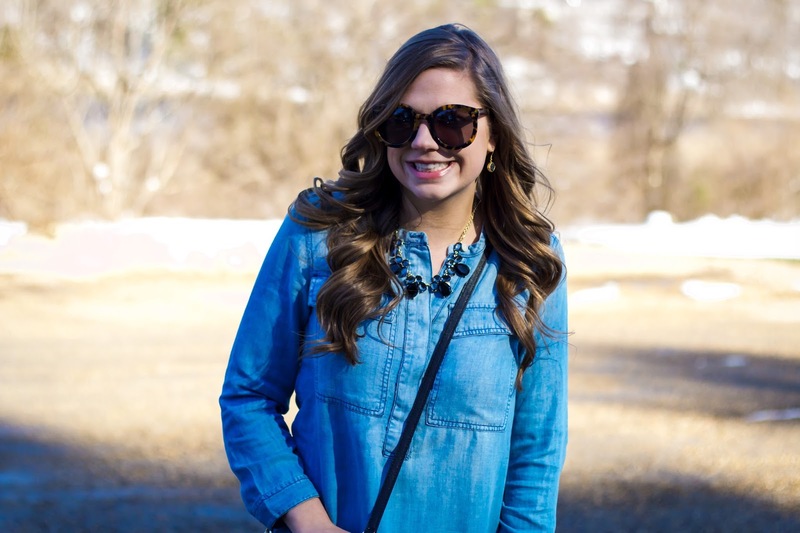 Dress / Sunglasses (25% off with code "INTHEFAM") / Purse (25% of with code "INTHEFAM") / Booties / Watch c/o / Earrings, Necklace, Ring c/o Rocksbox (use code "stylecubbyxoxo" to try for one month free!) / Bracelets c/o use code "stylecubby" for 20% a stack! Though I may look happy in these pictures, it was f r e e z i n g and yes, that's snow behind me. Welcome to April in New England. Luckily, I was pretty happy since this is actually the softest dress I have ever worn. 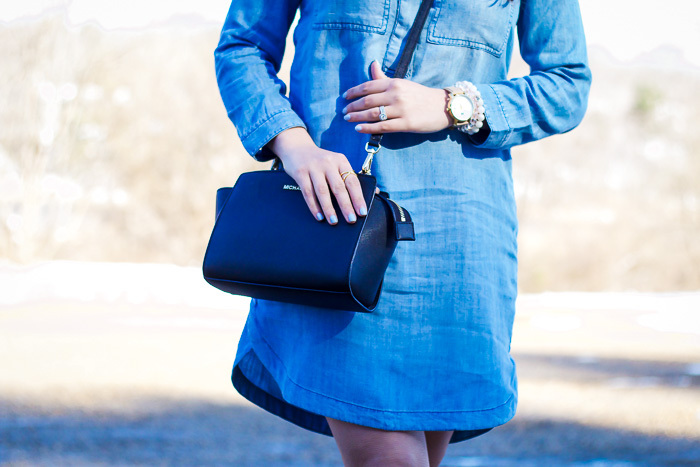 I have been looking for the perfect chambray dress for over a year now and never found one I loved enough to bring home with me. There are so many styles; cinched waist, mini, maxi, sleeves, no sleeves, buttons, ties, dark, light, and the list goes on. I couldn't decide what I liked best. 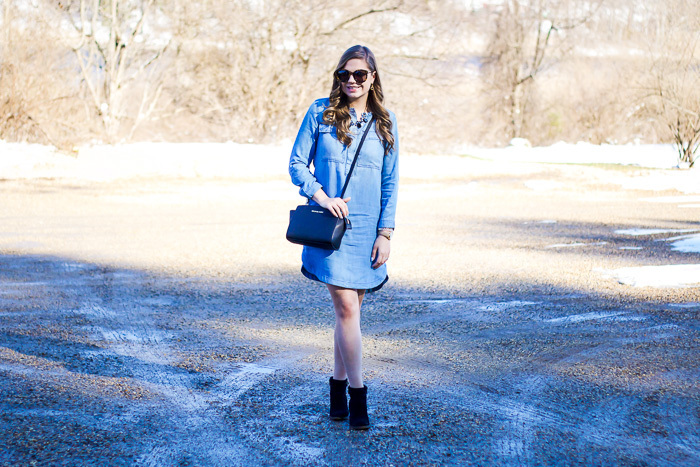 Then last weekend I stumbled upon this chambray shift dress and knew instantly it was the one. The wash was perfect, I liked the scooped hem, the long sleeves, and mostly just how soft it was! I can see this dress working all year long. Wedges or sandals on a cool day in the summer, booties in the spring, puffer vest and boots in the fall, and a sweater, tights, and riding boots in the winter! Super versatile! TWINS!!! 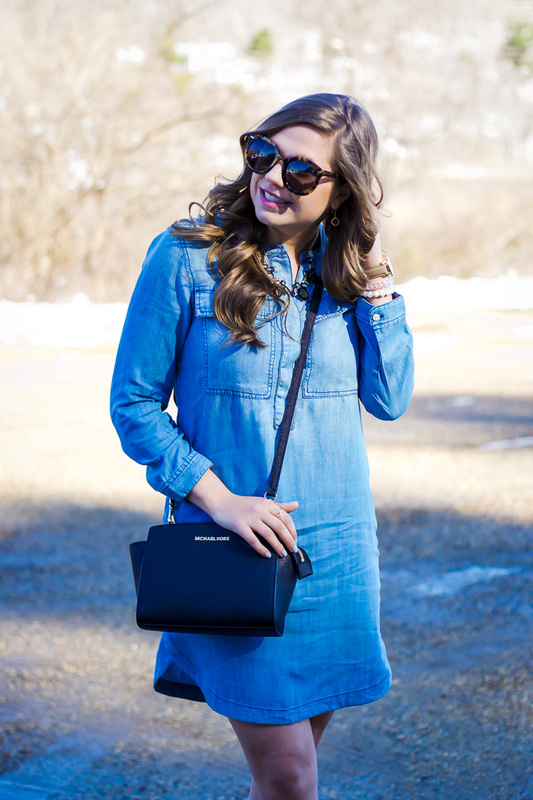 I literally had been searching for the perfect chambray dress, too, and THIS is the same one I went with! I haven't worn it yet but it's coming with me on vacation this weekend so I'm so excited to see how cute it looks on you (fingers crossed it looks ok on me, too!)! Hope your weather starts warming up, love! SO FUNNY!!! It really is an amazing find, can't wait to see how you like it! Ah I can't believe there's snow on the ground! It's been chilly here with a little frost but no snow. Lovinggg that dress! Me. Either. Not happy about it but it will be gone soon! Love this! I've been thinking about this dress for a while, I should just get it! Yes, you totally should! I love it! You look so gorgeous!!! Love the outfit! Def keep looking! And I would totally check this one out if I were you :) Thanks for stopping by! I don't know how y'all brave the cold up there!! 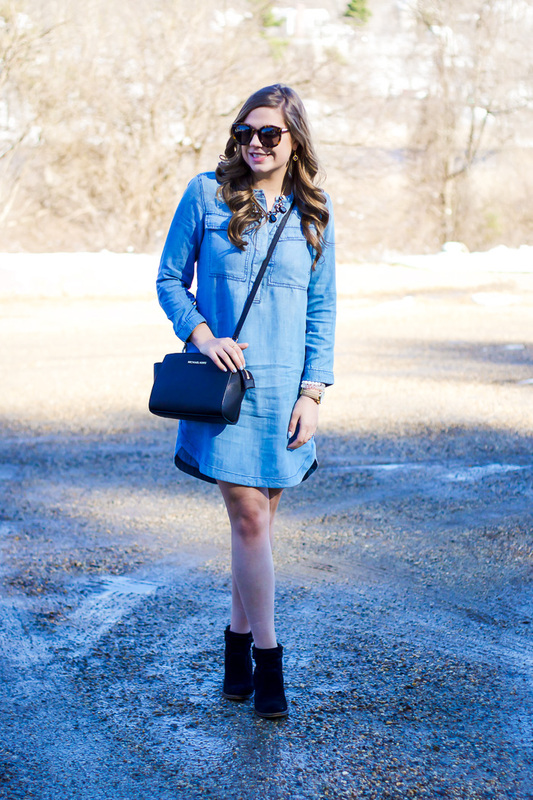 Spring is near for you I'm sure.. Loving this chambray dress and booties. 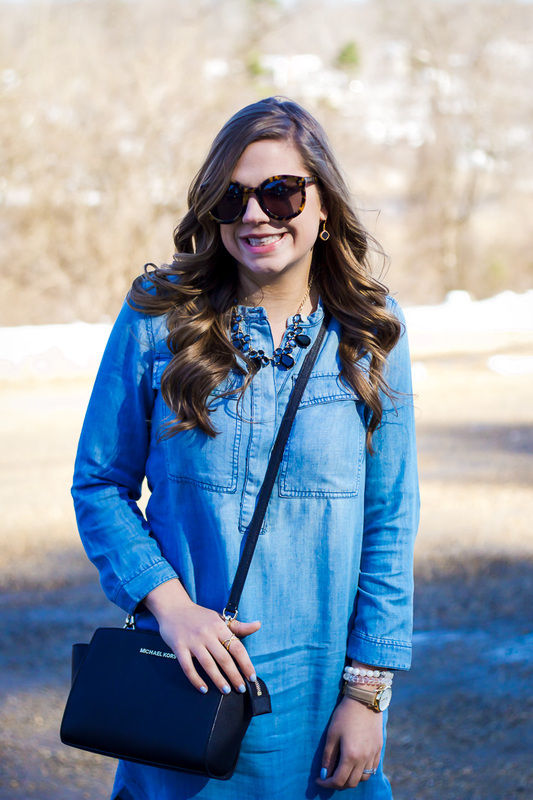 Chambray is probably my favorite ever! Cute look! Please teach me how to do my hair like that! It looks so fabulous :) That dress is so darling and is the perfect day dress! You're totally right - you can style this so many ways and wear it season to season!